We previously reviewed WD’s fastest hard drive for mainstream users, content creators and gamers (the WD Black 6TB WD6001FZWX); but how about the “NAS version” of this drive? Does WD have a drive that will offer the same fast performance of the WD6001FZWX for a NAS environment? Today, we are going to check out and review the WD Red Pro 6TB (WD6001FFWX) hard drive. This hard drive was announced late Q3 of 2015 and came out right after the WD Black 6TB was released in the market. WD not only increased the capacity of their WD Red Pro drives, but they are also faster and come with a larger cache. Are you in the market looking for a larger and faster NAS drive? Please continue reading our WD Red Pro 6TB review below and learn more about this drive. The WD Red Pro and non-Pro lineup are the company’s solution for NAS environment. The WD Red Pro series is basically geared towards SMB customers or small-medium businesses and is an ideal storage for 1 up to 16 bay medium to large-scale NAS environments. The WD Red Pro hard drives are also applicable for power users or pro-consumers and content creators who need a large storage space without compromising the performance. It’s engineered to handle increase workloads, specially for businesses, and WD has beefed up the specs and features of the new WD Red Pro drives. The WD Red Pro 6TB drive, including the 5TB capacity, is now built with 2x the cache compared to its predecessors. It features NASware 3.0, an exclusive advanced firmware that enables seamless integration, robust data protection and optimal performance for systems operating in a demanding NAS environment. These drives are also built with a multi-axis shock sensor that automatically detects subtle shock events and along with dynamic fly height technology which adjusts each read-write function to compensate and protect the data. This combination of technology further protects the drives in larger 1 to 16 bay NAS environments and helps increase hard drive reliability. The WD Red Pro 6TB (and 5TB) drives are also equipped with hardware vibration compensation technology that monitors the drive to correct both linear and rotational vibration in real time, further increasing drive reliability and enabling high performance in higher vibration systems caused from drive to drive vibration as well as from the high speed fans used to cool the larger systems. On top of that, the WD Red Pro drives are extensively tested and carry a long 5-year limited warranty. Check out the specifications table below for more details of each capacity, and then we’ll proceed with a closer look at the hard drive itself. The WD Red Pro 6TB is a standard 3.5″ hard drive. Despite having a larger capacity, the dimensions of the drive are basically the same with other hard drive capacity. 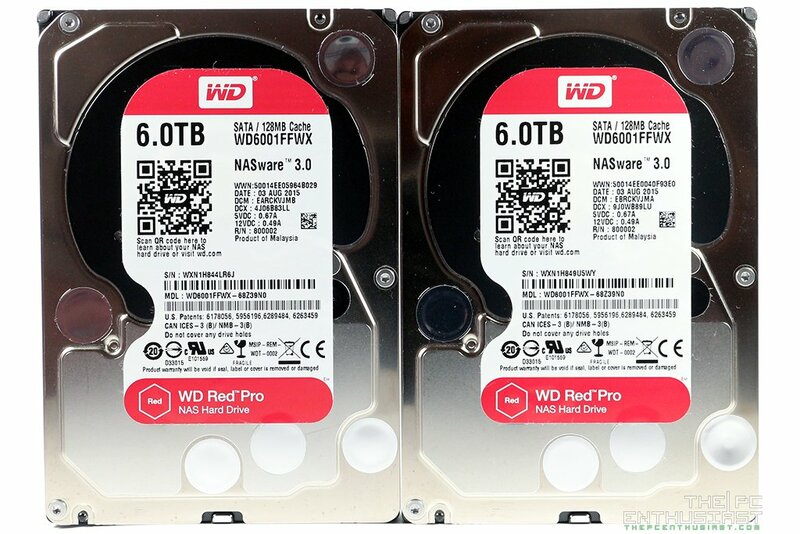 The (front) facade of the WD Red Pro 6TB is similar to the WD Black 6TB. The only difference is this one has a red label and the other one has a black label. The design of the aluminum enclosure is similar on the front (top) portion; however the bottom portion looks different. Most WD drives have the same size and dimension, about 26.1mm in height, 147mm in length and 101.6mm in width. These drives weigh approximately 1.58lbs or 0.72 Kg each. Most, if not all, heat producing components on the PCB are in contact with the aluminum enclosure. A thermal pad is applied in between to help the heat transfer more effectively. The aluminum enclosure itself acts as a large heat sink and keeps those components cool. Upon removing the PCB at the back of the WD Red Pro, we see a couple of foam pads placed between the enclosure and the PCB. The foams dampen the vibration produced by the spinning disks and helps protect the components on the PCB. Upon closer inspection of the circuit board, the WD Red Pro 6TB hard drive features an AVAGO TT07143 dual core processor. It is paired with a Samsung K4B1G1646G 128MB DDR3 chip that serves as the drive’s cache. Near the Samsung chip are seven Winbond 25Q808WVIG chips (6 on the left side and 1 on the right side). This is where the drive’s firmware is stored. 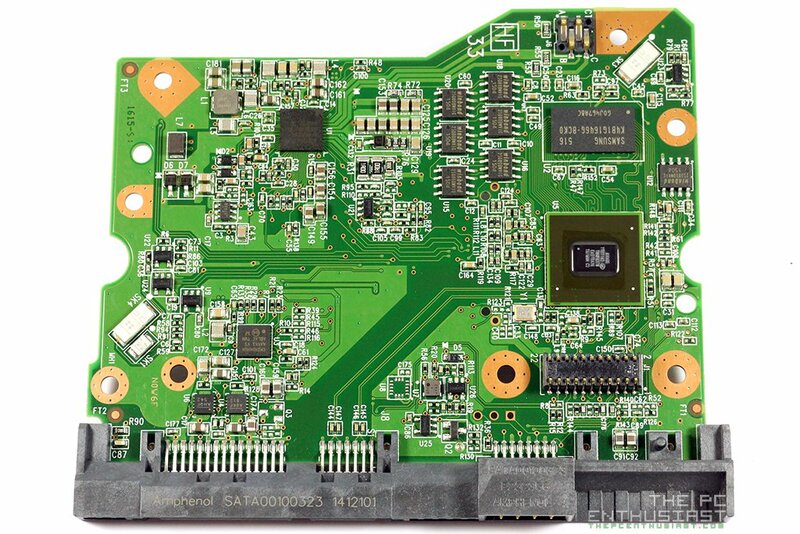 There’s also a WDPIKEA49 chip (Western Digital PIKE) that is responsible for controlling the drive’s motor. Now let’s see how the WD Red Pro 6TB performs on the succeeding pages. NVIDIA GeForce GTX 1080 3DMark Benchmark Surfaced – Faster than GTX 980 Ti?